Taking time for a birding photo, it seems, happens to you many times while just taking a leisurely walk. Such an activity can yield a birdwatcher many opportunities for photographing birds. Carrying your camera or phone along, allows you to be ready to capture a stellar photo of a fantastic bird should the occasion arise. 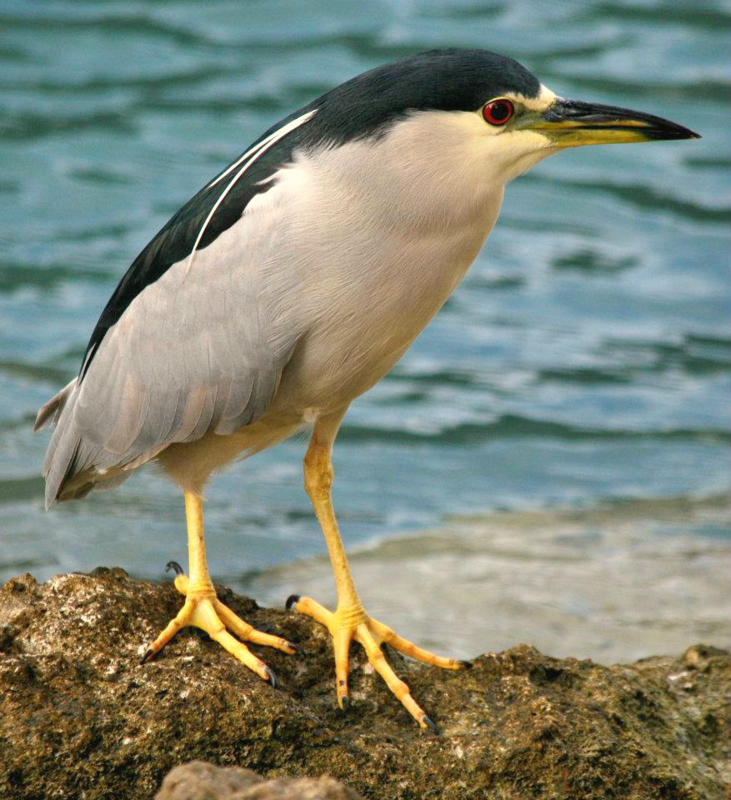 Photo of a beautiful Black-Crowned Night Heron perching on rocks. The color contrast of its white against the blue of the water caught my eye on the walk. Such was the case with THIS pleasant surprise. I was walking back to a boat observing the many colorful fish along side the waters’ edge. 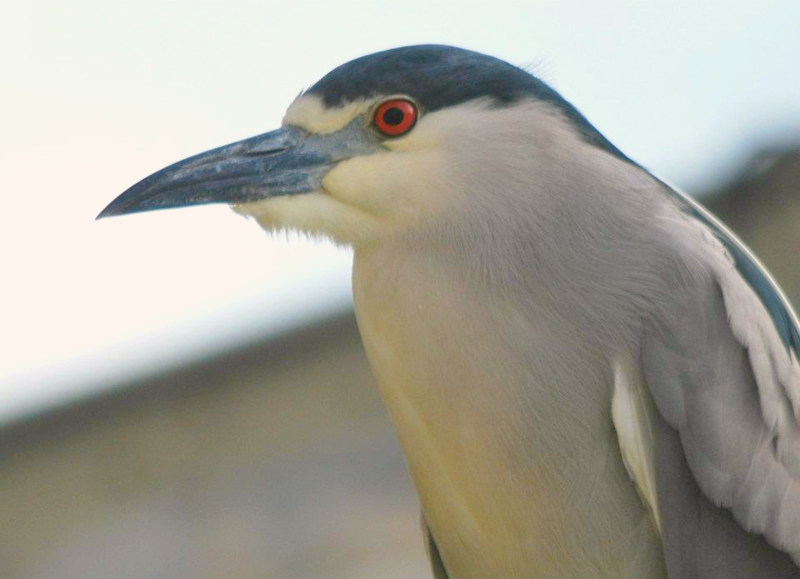 As a result, I stumbled upon this gorgeous Black-Crowned Night Heron. The heron sat perched watching the same fish I was along the rocky bulkhead at the busy Miami Marina. As a result the dining table was perfectly set for the heron AND the photo! Early morning or late afternoon, birds are preparing to eat. Wading birds are usually standing along or in shallow water allowing the sunlight to light up small fish, frogs, or snails for them to grab with their long pointy beaks. They are usually deep in study of small ripples being made by tiny specimens in the water. As a result, you should have a good amount of time for not only several photos of the bird, but several poses as well. For example, this Great Egret was standing slightly above the water, peering into the shallow lit up water. Ripples were present. 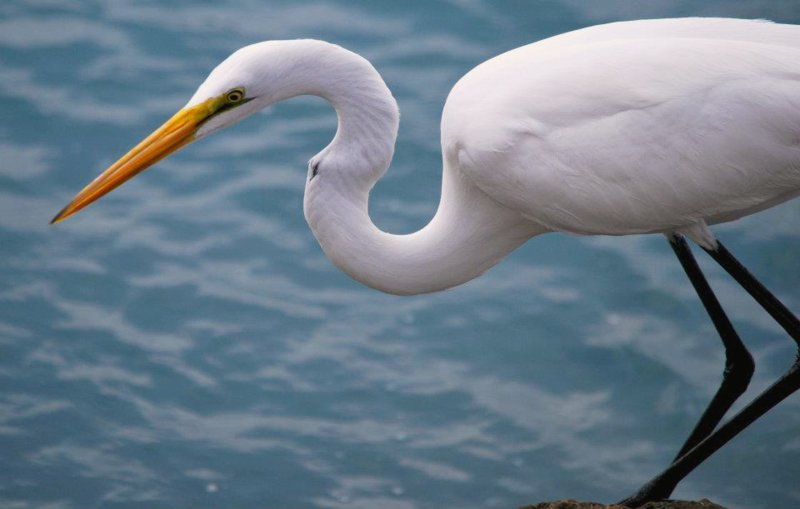 The Egret was concentrating on the small fish and waiting for the right moment to spear it. I watched closely as “S-shape” was forming in its neck. From that, it was obvious it was about to strike. I started clicking on the camera in hopes to capture the moment. Egret is deep focus. The neck is starting to crook into an “S.” A fish strike is evident. My patience paid off on the walk. The camera was able to capture the small fish the Egret caught! Success! 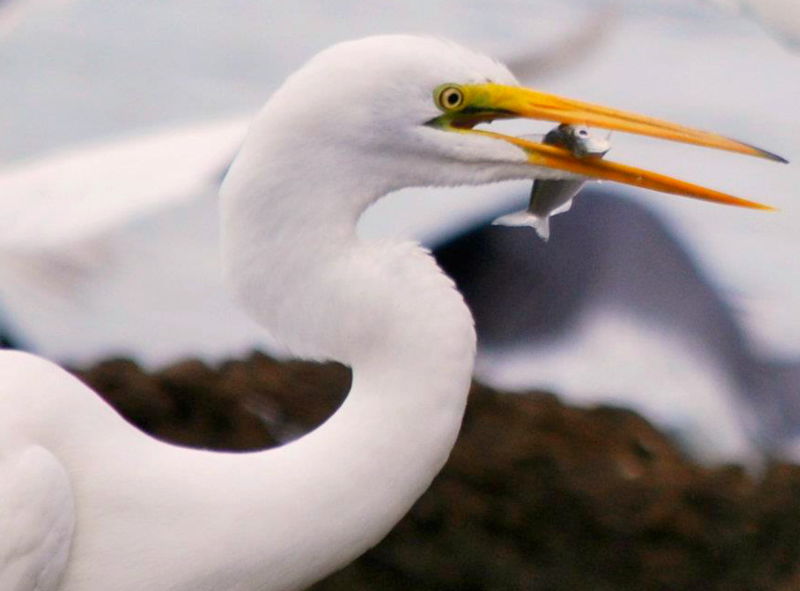 The Egret caught its fish! What an exciting walk along the water! Where There’s One, Look for More! The Black-Crowned Heron and Great Egret were not to be outdone by the Green Heron that was also, at the same dinner table! It was most amusing to photograph it. 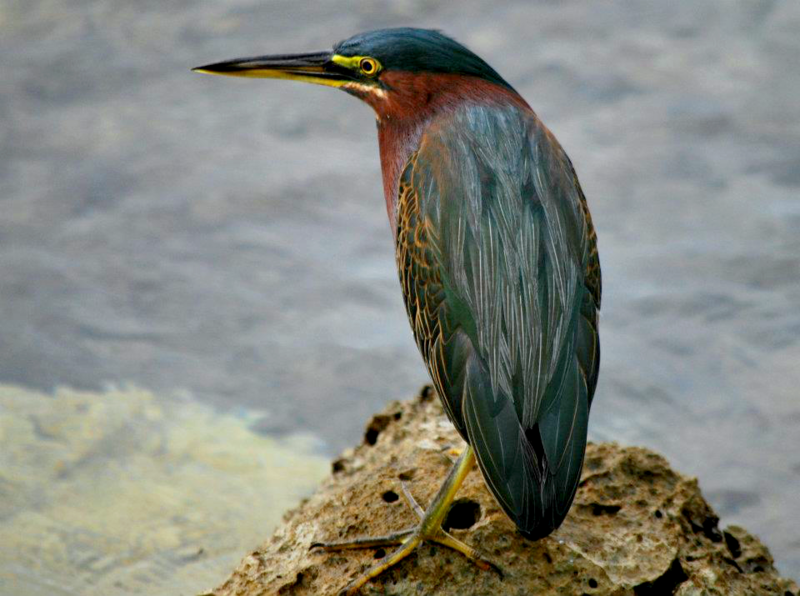 Green Heron watching closely the shallow water for ripples. When you’re walking, you also see them at your eye level perched on a pole, or tree branch or even a gate. This Black-Crowned decided to sit on a piling near the side of a boat tied to the same dock as the boat I was going back to. I just stood there and waited. The wind was blowing about and I wasn’t going to risk spooking it off the piling before I photographed it! Black-Crowned Night Heron on piling. What a nice close up that presented itself on my walk! What an amazing reddish-orange eye in contrast with the white and gray blue feathers. Glad that I cast my gaze off to the side and saw it sitting there on the piling! Select early to mid-morning or late afternoon before sunset for viewing birds when they are trying to eat. Be careful not to get too close and agitate them as they are attempting to eat. Use the zoom on your camera or phone to keep a safe distance to not spook the bird or the food they’re trying to catch. Take a verbal or written note on your phone as to the date, the weather conditions, time of day and identification of the bird for future reference. Look up the bird online on Ebird or Allaboutbirds, Audubon or consult your birding manuals for identification. Taking a walk has always been a great source to observe birds for photographs. Enjoy taking your walk at different times of day and during different weather conditions. Even different seasons of the year, the same walk may reveal a few migratory birds to your area. Be sure and bring your camera or phone with you. As always, try to be quiet, as still as possible, and be patient when you see one. There’s no telling WHAT bird you will run across sitting there waiting for YOU to photograph on your leisurely walk!